Designers: Signe Bindslev Henriksen and Peter Bundgaard Rützou. Standout: With an eye to encouraging lingering and lounging, designers Signe Bindslev Henriksen and Peter Bundgaard Rützou devised an organically shaped sofa that warmly embraces the sitter. Designers: Aïssa Logerot and Amandine Chho. Standout: The young French duo’s design, originally fabricated by Moroccan craftswomen (via the U.N. Development Programme), gets a manufacturing-friendly reboot with epoxy-coated steel bands. Designers: Claire Bataille and Paul Ibens. Standout: The Belgian architects, partners for 45 years, created a beautifully proportioned seat in solid oak (offered in four lacquer hues and natural) that can live inside the home or al fresco. 4. Firm: Bethan Gray Design. 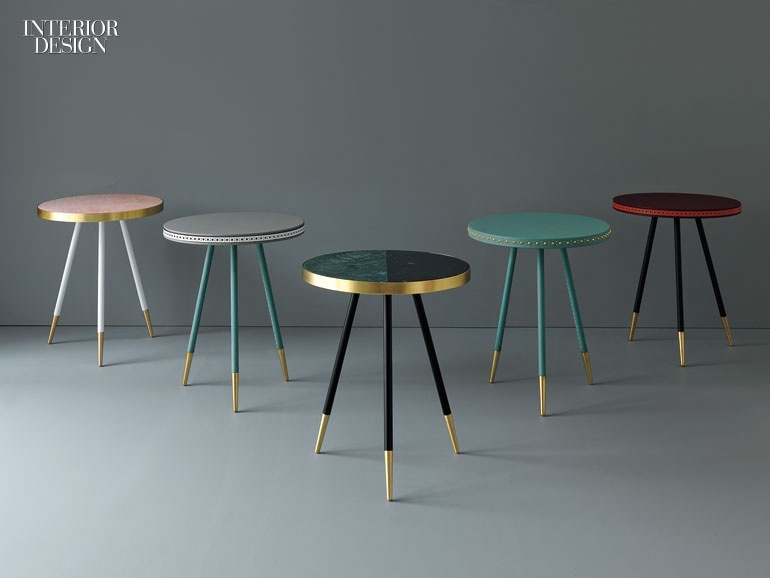 Standout: The award-winning Welsh designer assembled these tables from polished and lacquered marble in a range of colors—including single-hued and two-tone versions. Standout: Famed for its galvanized sheet-metal furnishings, the 89-year old company teams with the designer on a series of brightly colored storage units offered in a range of sizes, hues, and configurations. Designers: Aimee Betts and Sarah Colson. Standout: Pleated glass shades and two-tone knitted cables lend textured panache to the English duo’s pert pendants, available in numerous hues. Standout: A flickering flame was the starting point for Levy’s candleholder design, distinguished by a silvered base that amplifies the light source and reflects the surrounding environment. Standout: First produced almost 20 years ago, this rainbow-hued lounge gets a new lease on life with upgraded materials and removable covers; its playful mix of classicism and wit remains intact.